Last week, the national spotlight was on Minneapolis for Super Bowl Sunday, where the Philadelphia Eagles pulled out a close victory over the New England Patriots. 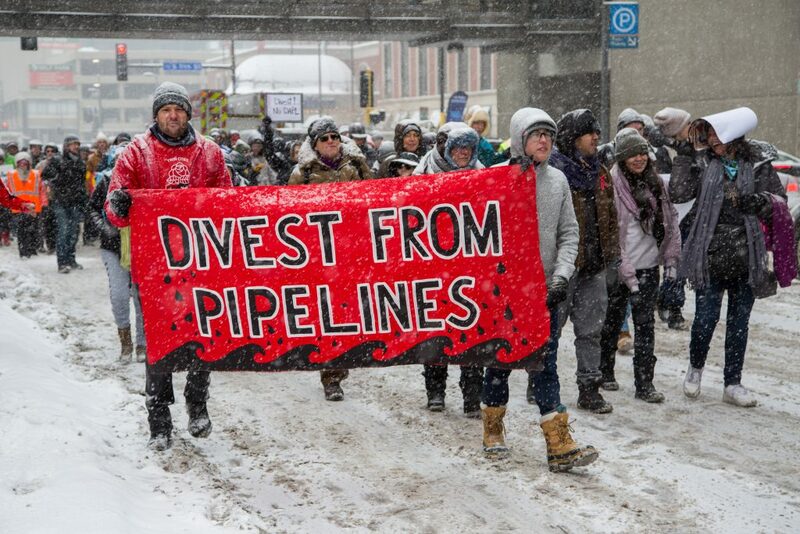 But much of the local spotlight in Minnesota was on the streets, where hundreds of activists braved frigid temperatures and blinding snow for a series of actions demanding the US Bank end its funding of pipeline companies like Energy Transfer Partners (ETP). The background: Despite positive movement last year to stop funding oil and gas pipelines at a project finance level, US Bank has continued to fund companies whose primary business is…building oil and gas pipelines.Most prominently, US Bank recently served as Trustee of a $1 billion bond for Energy Transfer Equity – the parent company of Energy Transfer Partners, which is the owner of pipelines such as Dakota Access, Rover, Bayou Bridge, TransPecos, and Mariner East 2. 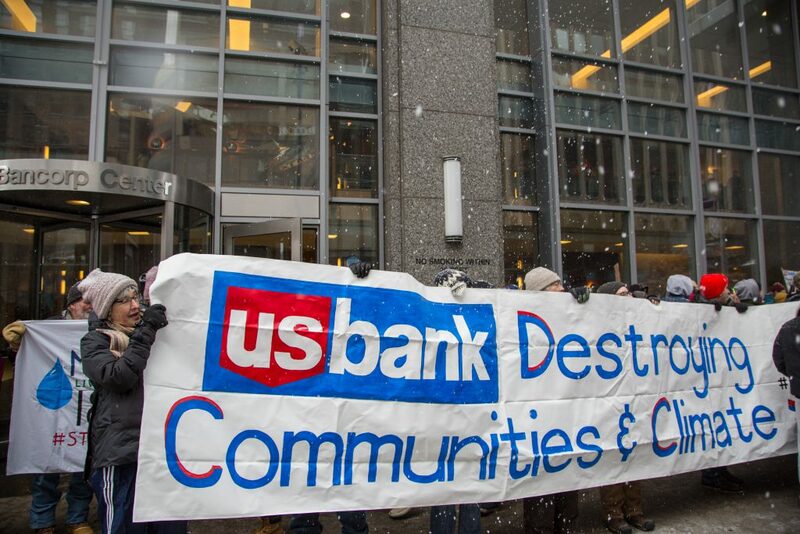 Then, despite pressure from activists asking them about this action, US Bank joined a separate, new $4 billion credit facility financing Energy Transfer Equity. Led by indigenous communities along these pipeline routes, climate activists and allies from around the country came together last week to push US Bank to end their relationship with Energy Transfer Partners (much like they recently ended their relationship with prominent tar sands pipeline builder Enbridge). Their message: No financing for pipelines means no financing for pipelines – and it’s time for US Bank to divest from Energy Transfer Partners. 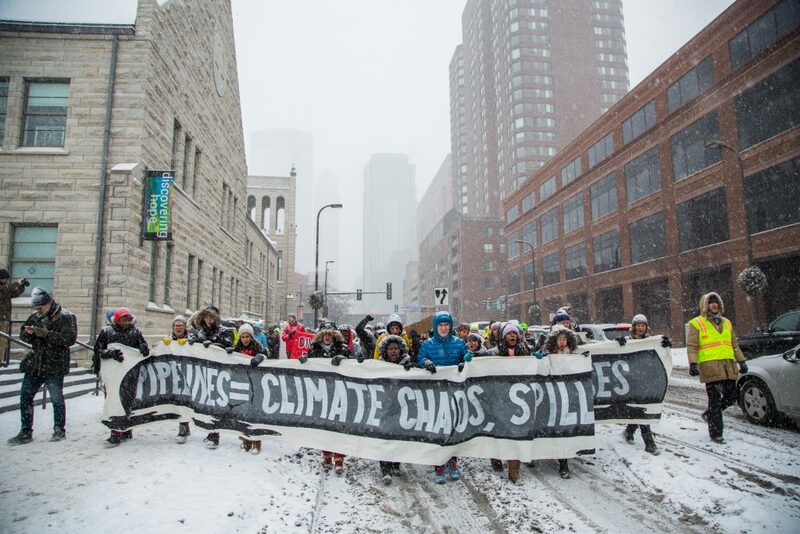 On Saturday, February 3, hundreds of activists came out despite blizzard-like conditions and freezing temperatures hovering below 10ºF for a rally at US Bank headquarters in downtown Minneapolis. They rallied at the bank’s offices, then moved to occupy a downtown intersection. After engaging thousands of passersby in town for the Super Bowl, the protest took to the streets and marched through downtown for several blocks. The march was a huge success not only in person, but also as a tool to spread the word to the world about this coalition effort to end US Bank’s financing of ETP. Over 150,000 people watched Facebook livestreams of the rally and march, with thousands sharing on other platforms as well. On Twitter, thousands of people retweeted and shared images of the action, the local coalition’s #SBLIIBlackout hashtag jumped to Top 2 trending in Minnesota, while both #DefundETP and #StopETP made the Top 10. The rally made headlines in Minneapolis and around the country, despite the heavy news presence of the Super Bowl the next day. Thousands more grassroots activists visited the Stop ETP coalition’s US Bank page to learn more about the campaign and take action. This effort didn’t come out of nowhere – in recent months, dozens of organizations sent a letter asking US Bank to divest from ETP, and over 30,000 grassroots activists have sent petitions demanding the same. To date US Bank has refused to respond with meaningful engagement, and that pattern continued later last week, after the hubbub of the Super Bowl had departed from town. A delegation of indigenous women who led the fight against the Dakota Access Pipeline came to Minneapolis to meet with Reba Dominski, Chief Sustainability Officer and Senior Vice President at US Bank. Rather than meet with these women, Reba Dominski had the police called and had them removed from the building without a meeting. Over 10,000 people watched via Facebook as all this unfolded, further building the audience of sympathetic activists watching as US Bank refuses to engage with the people whom their financing of Energy Transfer Partners is directly harming.